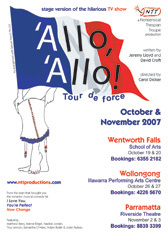 Based on the hugely popular TV comedy series, the stage version of 'Allo 'Allo follows the adventures of Rene, the hapless cafe owner in war-torn occupied France, as he and his wife, Edith, struggle to keep for themselves a priceless portrait stolen by the Nazis and kept in a sausage in their cellar. Rene is hiding two British airmen and is endeavouring, with the help of the Resistance, to repatriate them. However, communications with London through a wireless disguised as a cockatoo add to the many embarrassments he endures in the company of his patrons. Matters come to a head with the news that the Fuhrer is to visit the town and the cafe becomes filled with tricksters intending to impersonate Hitler before the event. Rene will need all the wit he can muster to save his cafe and his life...!